One lens into California’s size is its public education system. Six million children under the age of 18 attend public schools — including 600,000 in charter schools — while nearly 3 million students are enrolled in the state’s storied higher education system, which is still struggling to recover from decades of underfunding. The largest teachers union has 325,000 members. “I think this is going to be an important race,” said John Deasy, CEO of The Reset Foundation, a Bay Area juvenile justice reform organization, as well as a former Los Angeles schools superintendent. “My view is the current regime in Washington has actually not pushed California further to the left, it has pushed it further into the national spotlight. Newsom is running as the campaign’s progressive, which some find incongruous with his success as a businessman, who founded and owns a constellation of restaurants and wineries. As a policymaker, despite CTA’s support, his education credentials are scant and appear more pragmatic than ideological. He supports community schools, a union job-creator, but doesn’t reject charters. 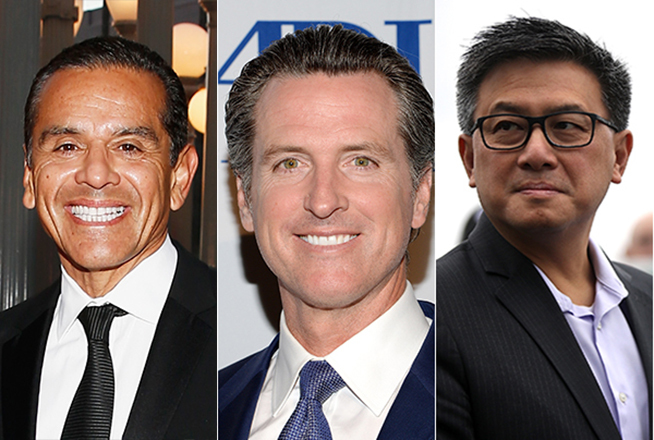 Early polls, which show about one-third of voters to be undecided, put Newsom’s support at 23 percent followed by 18 percent for Antonio Villaraigosa, a former state legislative leader and two-term mayor of Los Angeles (as well as its first Latino mayor since 1872). Villaraigosa shares with Newsom more than a little dash, an eye for well-cut suits, and a gift for campaigning. He’ll run as a business-friendly moderate. Unlike his younger rival, the east L.A.-born Villaraigosa, 64, is known for his education record and ardent support in the school reform community, which believes he pushed for charters and more accountability in the nation’s second-largest school district with little political upside and clear risks. Like Richard Daley in Chicago and Michael Bloomberg in New York City, Villaraigosa also worked to win control over Los Angeles’ schools. He successfully convinced Sacramento to pass legislation giving him authority, but two courts found that the bill deprived Angelenos of their right to participate fully in the city’s schools. City residents elect a seven-member school board; the spring 2017 race was the most expensive in history, with charter supporters and teacher unions spending a total of nearly $17 million. “Fairly or unfairly, probably fairly in many ways, he was viewed as a showhorse, not a workhorse,” said Larry Grisolano, a top advisor in both Obama presidential campaigns who has worked extensively in California. Grisolano and other Democrats believe John Chiang, 55, the state treasurer and former controller, could be a dark horse. Currently polling at 9 percent — tied with John Fox, a San Diego-area businessman and the leading Republican, who is seen as having little chance — Chiang has raised $5.8 million, more than anyone except Newsom. He is little known outside the state but is liked by labor, particularly public employees, and, as the son of Taiwanese immigrants, has appeal to the state’s large Asian communities. “One thing about California politics is that the controller’s office is extremely important particularly to state employees,” said Grisolano. “He’s always been a stand-up guy for them.” Chiang became a folk-hero to state workers while Arnold Schwarzenegger was governor, refusing to execute furlough and wage reduction orders that he considered illegal. *Correction: Antonio Villaraigosa was Los Angeles’ first Latino mayor since 1872. Tom Bradley, who served from 1973-1993, was the city’s first non-white mayor. Information was corrected from an earlier version of this story.